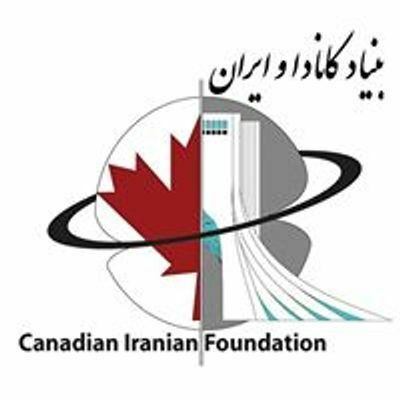 Canadian Iranian Foundation proudly presents the 14th. 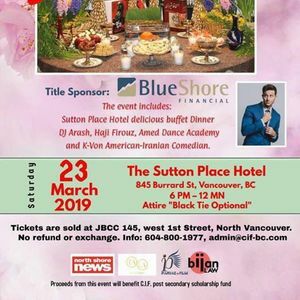 Annual Nowruz Gala on March 23rd. 2019 at the Beautiful Sutton Place Hotel in Vancouver. 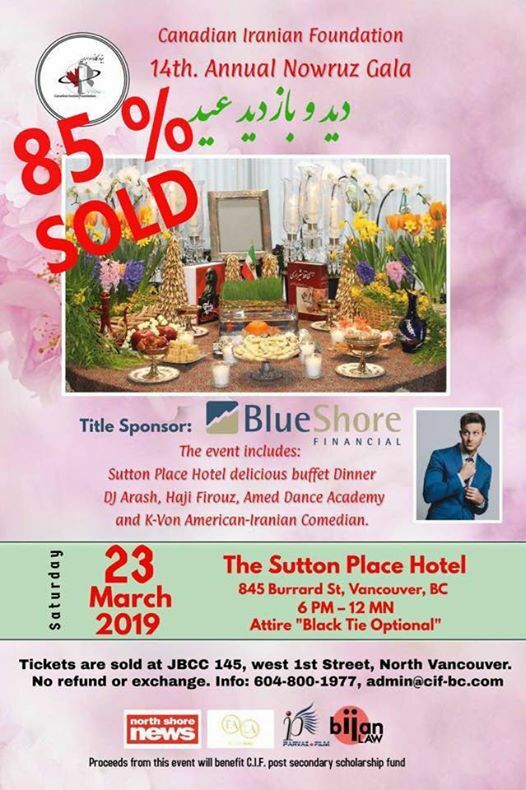 Event include the most delicious Sutton Place Hotel Buffet dinner and DJ Arash's music to dance the night away, K-Von American-Iranian comedian from USA, Amed dance Academy and Chickaklar Dance Ensemble. All proceeds from this event will benefit the CIF.s scholarship program for 2019. We are looking for for sponsors for this event. Very Early Tickets are $159.00 from now until end of January Early Bird $169:00 from January to the enf of February and from March 1st. $179. C.I.F. members receive $10:00 discount for tickets by showing their valid membership card for 2019. Special tax receipt for $1000 will be given to any one who buys a whole table of 10 guests. Children under 10 years old are $100 and above 10 yeras are furl price.To sponsor this event,please contact 604-800-1977 or e-mail:YWRtaW4gfCBjaWYtYmMgISBjb20=. C.I.F. is grateful to theBlueshore Financial for being the Title sponsor of this Gala and Bijan Law as sponsor. > 145, West 1st. Street, North Vancouver, BC. Essentially pure using essential oils for a green , toxic free home. Latin Plaza Toastmasters Club Kick Off Meeting! MAKE HEALTHY TASTE GREAT "SPRING CELEBRATION"